Apparently, a new student activist group was formed at George Washington University, where on Facebook, the group demanded to meet with the university administration to push ‘living wage’ for all workers and other progressive causes. Proposals to force colleges and universities to boycott, divest from and sanction (BDS) Israel keep failing in the most left-wing of enclaves, such as the Modern Language Association (MLA). Nevertheless proponents of the measure keep putting forth BDS propositions with increasing stridency. 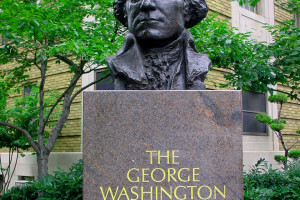 Another divest-from-Israel student resolution is making its way in the George Washington University student association, after a failed attempt to do so last year over lack of attention to detail. But one privilege they missed was an open invitation to this meeting. College Democrats at George Washington University fundraised for Planned Parenthood, a pro-abortion organization, and raised about $4,000. 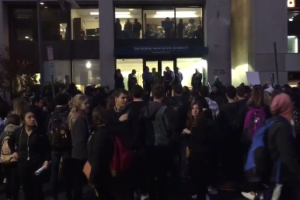 Due to a social media photo controversy, which was later investigated and cleared the students allegedly involved, George Washington University instituted mandatory diversity training for all students despite the investigation’s findings.